USS Princeton (CVL-23) is an Independence class aircraft carrier constructed through the redesign of the light cruiser Tallahassee in 1943. She was commissioned in 1943 and arrived at Pearl Harbor soon after training. 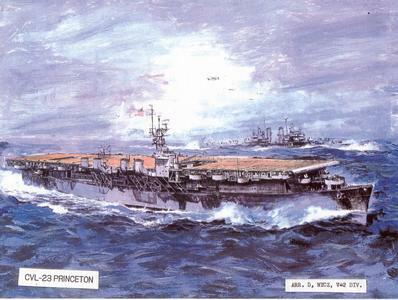 Princeton’s first mission was the occupation of Baker Island and the raid of Makin and Tarawa in the fall of 1943. She also supported the Bougainville landings, raided Rabaul and Nauru and assisted in the Gilbert Islands invasion. In the fall of 1944, Princeton was assisting in the Layte invasion, attacking the Luzon airfields. A Japanese dive bomber attacked Princeton, causing a fire to erupt. The fire continued to rage uncontained until the bomb exploded. The explosion not only affected her crew, it also caused damage and casualties to her sister ship, Birmingham, who was trying to put out the fire. After the surviving crewmen were pulled to safety, her fellow escorts sunk her.